Booties are my absolute favorite type of fall shoe. Having one or two (or four or five, who's really counting? 😉 staple pairs for the season can create endless outfits and will last you for years to come. Boots and booties never really go out of style, so stocking up on a classic pair like these is always a smart move. Despite my love of classic looks, I'm also never one to shy away from a fun or trendy pair of shoes. When making this roundup I wanted to share a mix of both timeless booties and trendy ones. I've noticed that boots are already starting to appear on Instagram and other social channels even though fall is a solid month away for most people, and trends are already emerging! I think my favorite trend for the upcoming season are metallic boots! I love this pair that is a mix of traditional style with that metallic flare, and believe that these can be paired with SO many different fall looks. That specific pair also comes in a leopard print that I sort of love, but don't know if it's for everyone. Let me know your thoughts on it if you take a look! Speaking of leopard print, I have always wanted a printed pair of booties, but never wanted them to be extremely loud or screams trashy. I think I found a nice medium with these faded leopard short boots! They have that edgy leopard print, but can easily be worn with any outfit as they are mostly neutral. I also wanted to include a pair of rain boots in here just in case where you live there happens to be heavy downfall during the fall! I'm going to be spending a good amount of time in the Bay Area with my family and there's alway so much rain, so I always want to be prepared with a cute and practical pair of shoes. Even though I know that taller rain boots provide more protection, I also find them to be extremely clunky. I decided to include this shorter glossy pair that exudes coolness (seriously, anyone else think that if they wore these boots they would just feel extremely chic?) and is completely on trend. I can't wait to get some rain here and throw these boots on. As much as I love having summer, there's only so much hot weather I can take, so I'm ready for fall to come as soon as possible! What is your favorite pair from above? Are you looking forward to fall weather or wishing it could stay summer longer? I love the deep red booties! That color just feels so cozy and fall, even though its still 100 degrees outside. I wear a lot of black, so they would be a fun "pop" of color. The cut out detail just makes them that much more fun! Fall boots and booties are my all time FAVORITE shoes. I just bought a new pair of gray suede booties and I can't wait to wear them all fall. 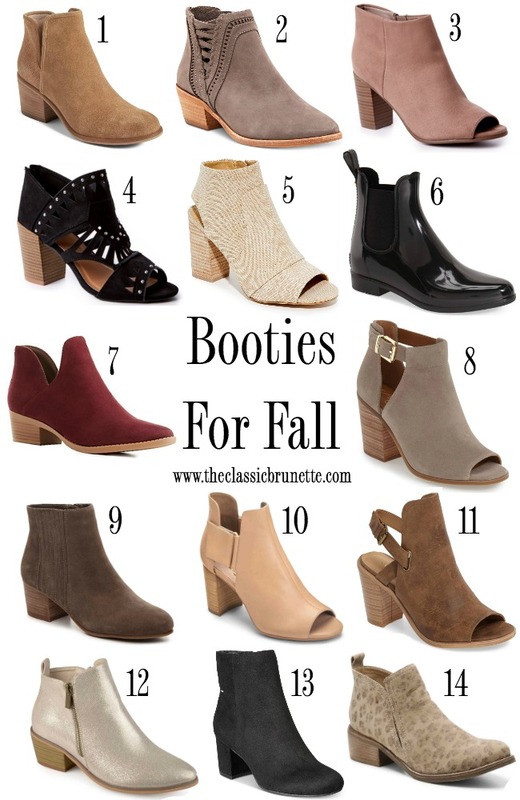 I'm a huge fan of booties, so I am loving all of these! I love boots, all boots. All styles, Heights, and embellishments are my favorite. Here I would choose number nine. My fav is #1. I just got these and they are super cute on. I can't wait to wear them!! Ooooo so many great choices Sami! Love the idea of getting a pair of metallic booties; I actually just ordered a pair of olive booties with the cutout/perforation look that I'm so excited to style. Such cute picks!! #8 is my favorite! So many cute booties here! Gotta love a great pair of booties. I love #8, #12, and #14! Love your picks! I am so excited for it to cool down and can't wait to wear my booties again! I like #5 even if it's straw fabric which is better for summer lol!These booties are cute! I bought pair #11 about a month ago and I am already wearing them all the time! Girl you make me wanna run to the store and try all these on! I just got some cute split shaft booties but now I want metallic ones! Those leopard print booties are too cute! Fall is definitely my favorite season. I actually own about a hand full of these (or pair that look very similar) ! #7 are the cutest!! I bought a pair of burgundy booties last year – wasn't sure if I'd wear them – and they were my go-to boots all season long. So many lovely options. Crushing over the details on #5 and $6. The burgundy color and shine make them pop. Omg! 3, 4, 10, and 14 are SO on my wishlist now. Last year the only shoes I bought were booties haha so these definitely need to be added to my closet asap! I am obsessed with #8! How cute! Love these pics! I'll take one of each please! I'm so ready for fall and to break out the booties! Um, totally in love with that maroon pair. Gorgeous! Ugh! I still have yet to find the perfect booties for me! I love #1 though!